August Is For BNSF Fans! BNSF fans are going to enjoy the new AZL releases for August. First, AZL has released BNSF tri-level autoracks. They appear with the ‘swoosh’ logo. Two runner packs and two singles have been released. The first set is item 91005-1. The road numbers are: 852630, 902363, 905689, 907235. The second set is item 91005-2. The road numbers are: 907497, 908537, 908909, 909215. The MSRP is $131.00. The first single car is item 91955-1. The road number is 852050. The second single is item 91955-2. The road number is 852630. The MSRP is $38.00. The next BNSF release is 60’ beer cars. These are the same cars seen lined up outside the Coors Factory in Golden California during the weekend of the Z National Convention. A runner pack and a single have been released. The runner pack is item 90263-1. The road numbers are: 782418, 782403, 782421, 482473. The MSRP is $120.00. The single car is item 91263-1. The road number is 782402. The MSRP is $34.00. AZL has released Illinois Central Gulf waffle side gondolas*. A runner pack and a single are available. The runner pack is item 902411-1. The road numbers are: 246001, 246002, 246003, 246004. The MSRP is $117.00. The single car is item 912411-1. The road number is 246005. The MSRP is $32.00. * Note these car were produced in low quantities. Dealers with standing orders will receive these cars. They are effectively sold out and we are not anticipating receiving addition sets and singles. A new set of DTTX NSC 53’ well cars have been released. The runner pack is item #90601-7. 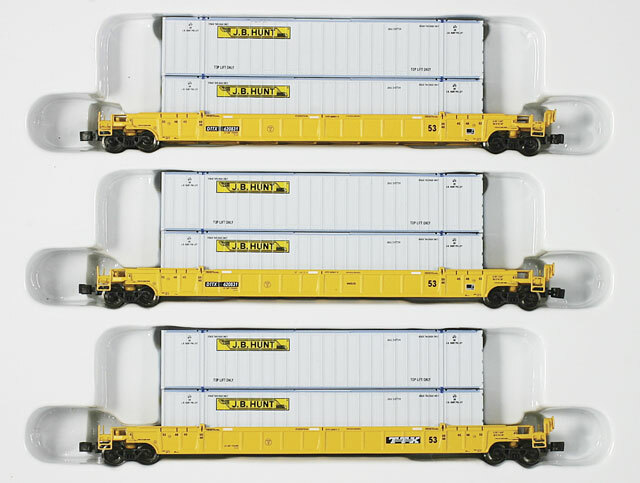 It comes with six 53’ containers lettered for J.B. Hunt 53’ containers. The road numbers on the cars are: 620831A-620831B-620831C. The MSRP is: $133.00. A DTTX NSC 53’ single well car has also been released. The single car comes with a 48’ ITEL container and a 53’ CSX container. The road number is 655524. The MSRP is $46.00. Standing orders have been shipped. We are now taking orders for these and previous releases.